A little over four years ago, I introduced the world to my latest project, Democracy in Practice, with far more fanfare than it probably deserved. 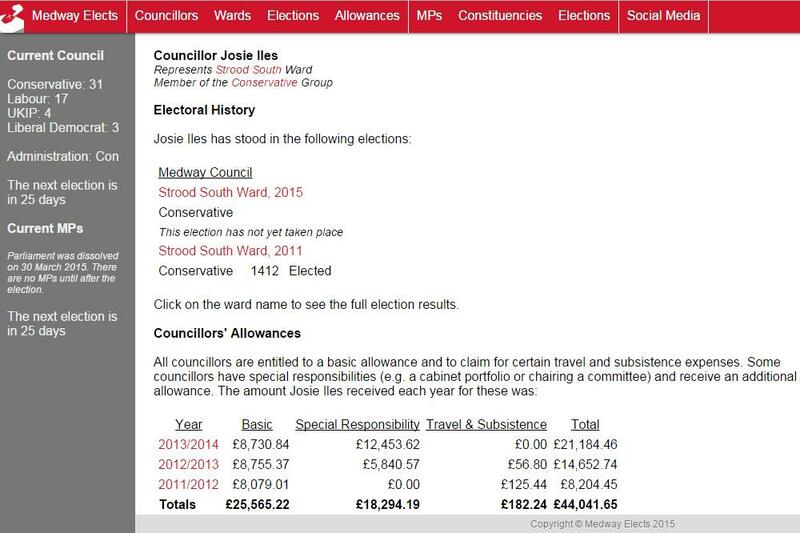 It was, essentially, a collection of Medway Council election results and basic councillor details (i.e. their allowances) presented on a primitive site that looked like it belonged in 1997. After the local elections in 2011, I moved away from Medway and started to migrate the format to my new-found home in Birmingham, although I didn’t live there long enough to complete the project and launch. I know that Democracy in Practice had its fans, but I was never happy with the look and feel of the site. I have always been a programmer, never a designer. So when the code started to show flaws, and I got involved in other projects which took up my time, I switched the site off and let the domain name expire. I thought that would be the end of the story. Today, I am launching Medway Elects. We are 25 days away from the most important, and most unpredictable, general election in my lifetime – and, on the very same day, voters in Medway have a chance to change the makeup of Medway Council. I felt Democracy in Practice could live again, but it needed a major facelift – and a lot of changes under the hood to make it function in exactly the way it should. I got to work building the basic site layout first of all. I modelled it on another website I had built for an Air Cadet project. It’s not flash – just easier to navigate and more pleasing to the eye. I am also working on building a mobile-friendly version. Next, I rewrote the code from scratch – using Democracy in Practice as a strong foundation – and began adding new elements to the website. 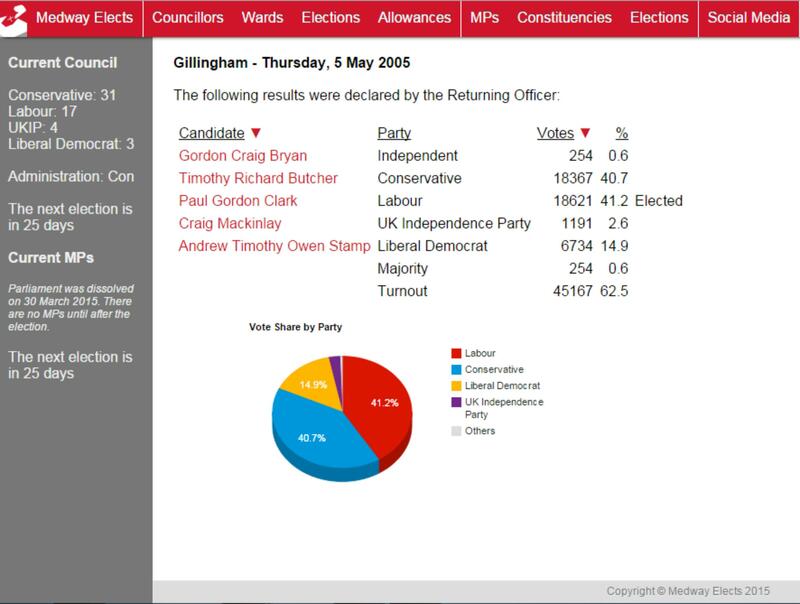 Medway Elects still contains election results (plus newly-added turnout figures, where available), including the ability to see each candidate’s electoral (and, where they have served on the council, allowances) history. But I am pleased to have been able to add electoral history for Medway’s three parliamentary constituencies (running from 1997). I am also excited to have been able to programme in various graphs to better illustrate party support and how it has changed over time. Clearly, as a party activist, I have never been able to lay claim to being an independent observer (although I have, in the past, had quiet words spoken in my ear for making independent observations on my blog or Twitter), but that is even more true now that I am standing in my first election as a candidate. However, Medway Elects is independent – it contains simply facts and figures, without any spin. Nothing on the site is designed to persuade anyone to vote for any particular candidate, with the only exception being the “Social Media” page, where anybody using the Twitter hashtag #medwayelects can join in the conversation. Perhaps the most exciting part of the Medway Elects which I am launching today is that it is not the finished article. I am continuing to explore additional improvements to the site – although most of these will come after the election, for obvious reasons. Until then, you can explore Medway Elects in all its glorious local political geekiness at www.medwayelects.co.uk. P.S. I would like to take this opportunity to thank the authors of this blog for their valuable advice over the past couple of weeks. Their contribution spurred me on to adding new features and tweaking what I had already created. You too can help make Medway Elects even better by letting me know what you’d like to see added.